This formula is the perfect combination of two ingredients that are known to brighten and whiten teeth. 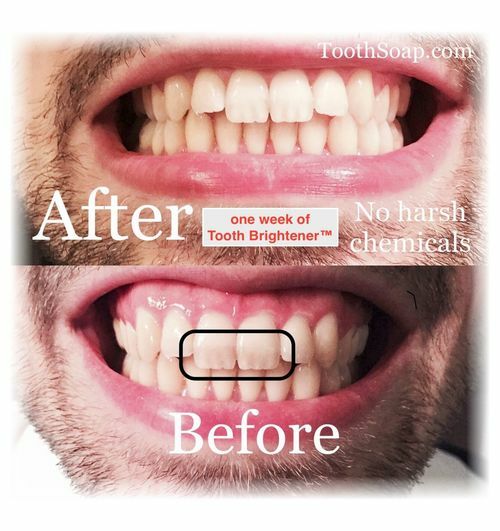 But instead of being harsh on their own, they blend together beautifully, forming a unique and gentle formula that takes care of food stains and other spots on teeth. Tooth Soap® contains ZERO abrasives - that means it's vital to 'gently remove' color from food deposited on your teeth at least two times a week. Eating healthy foods every day means food stains. Some drinks contribute as well. These common food stains can be removed quickly and gently with Tooth Brightener™. Tooth Brightener™ does more than just remove food stains. It also neutralizes acids in the mouth and bathes the teeth in calcium, a vital mineral for strong enamel. Both calcium and phosphrous need to be abundant in your saliva for proper remineralization. Packed in a 1 ounce amber glass container. Use at least once a week to keep teeth their brightest!